“Our three-dimensional map is a rare look at the insides of an exploded star,” says Dan Milisavljevic of the Harvard-Smithsonian Center for Astrophysics (CfA). This research is being published in the Jan. 30 issue of the journal Science. About 340 years ago a massive star exploded in the constellation Cassiopeia. 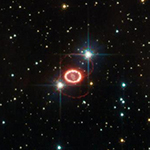 As the star blew itself apart, extremely hot and radioactive matter rapidly streamed outward from the star’s core, mixing and churning outer debris. The complex physics behind these explosions is difficult to model, even with state-of-the-art simulations run on some of the world’s most powerful supercomputers. 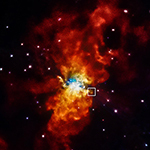 However, by carefully studying relatively young supernova remnants like Cas A, astronomers can investigate various key processes that drive these titanic stellar explosions. The Stratospheric Observatory for Infrared Astronomy, or SOFIA, Program began its third season of science flights on Jan. 13, 2015. SOFIA is NASA’s next generation flying observatory and is fitted with a 2.5-meter (100-inch) diameter telescope that studies the universe at infrared wavelengths. Water vapor in the Earth’s atmosphere absorbs infrared radiation, preventing a large section of the infrared spectrum from reaching ground-based observatories. SOFIA is a heavily modified Boeing 747 Special Performance jetliner that flies at altitudes between 39,000 to 45,000 feet (12 to 14 km), above more than 99 percent of Earth’s atmospheric water vapor giving astronomers the ability to study celestial objects at wavelengths that cannot be seen from ground-based observatories.